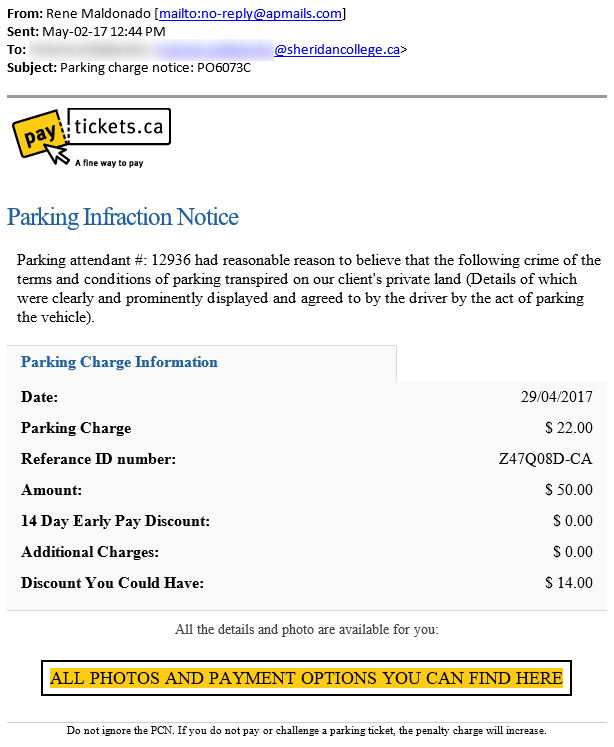 [May 3, 2017] Please be advised that there is currently a fake parking ticket phishing email in circulation that has been received by several users at Sheridan. If you receive this message DO NOT CLICK ON ANY LINKS. A copy of this bogus email appears below for your reference. Phishing attacks may use spoofed email addresses and fake web sites to fool the recipients into divulging personal information such as user names and passwords, credit card numbers, social insurance numbers, etc. For more information on phishing attacks, please see ‘Phishing Messages: Don’t Get Hooked’. If you received the email noted above and took any form of action (e.g. clicked the link and/or submitted payment), contact the IT Service Desk immediately for advice and assistance. The Service Desk can be contacted at extension 2150 or via email at servicedesk@sheridancollege.ca.